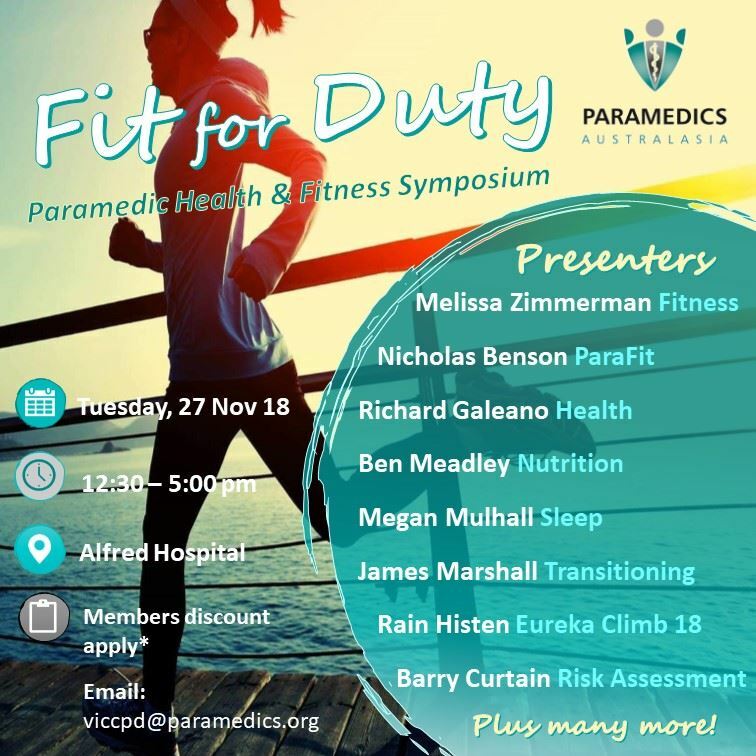 The Victorian chapter of PA is pleased to announce its next event: Fit For Duty - a Paramedic Health & Fitness Symposium featuring special guests from Sydney & Brisbane! This half-day event will include a variety of presentations on the essential aspects attributing to career longevity in Paramedicine. Attendees at this event will also receive a FREE Para Fit audiobook 'The Fit Paramedic 90 Day Body' valued at $199 (not yet released!). Light catering will be provided. Following this symposium will be the PA Victoria Annual Chapter Meeting (17:15hrs onwards). Attendees are invited to remain for this meeting. Pizza will be provided for ACM attendees.